You Can't Spell "Comedy" Without A "K" As In "Kathleen"! The Great Kathleen Madigan is coming to town on Saturday, May 4th, to record her upcoming TV comedy special at the Royal Oak Music Theater! I’ll be there and you can too… Shows at 7pm and 9:30! Produced by The Comedy Castle’s own Mark Ridley! 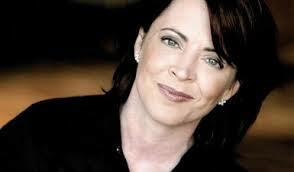 For tix… click on Kathleen Madigan. Pope Francis has decided not to give bonuses to the Vatican staff that usually come with the election of a new Pope. - So that white smoke you see is coming out of the Cardinals ears instead of the chimney. Details of Kim Jong Un’s childhood will allegedly be revealed by his father’s former chef. - Turns out during potty training Un could never hit the Cherrio in the toilet bowl…which explains his pre-occupation with hitting American targets with missiles. Carnival Cruise Line has announced that it’s spending $300 Million in improvements to it’s ships. - The upgrades will begin as soon as they get all of the ships towed back to port. McDonalds in Japan is offering a “potato basket” to hold your fries next to the sterring wheel so you can eat them while you drive. - It replaces the earlier version of the fry holder known as “your knees”. Bus drivers in Marseille, France, are threatening to go on strike because the pants they have to wear are too tight. - And bus riders in Marsaille, France, are threatening to boycott buses because the bus drivers pants are so tight they can see their Eiffel Towers. - They could kill two birds with one stone by just having the bus drivers trade pants with the plumbers. A consumer group projects that by 2019 airlines will be losing 70 million pieces of luggage a year. - This explains their new “$50-We-Won’t-Lose-Your-Luggage-Fee”. Before I wish you a great day…and Daughter #4, JoAnne, a great Birthday… just wanted to apologize for the much-promised brand new Podcast NOT going up this weekend. We actually recorded it - but due to a technical snafu (amazingly NOT my fault) it’s lost somewhere in cyber space. New one FOR SURE (I pinky swear) up this Friday! Thanks for your patience!